Lauren Marks is a Los Angeles native and a New York University, Tisch School of the Arts graduate. She spent a decade in professional theater and pursued a PhD at The Graduate Center at City University of New York. 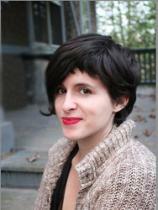 Lauren was an Emerging Voices Fellow for PEN Center USA. She has been awarded grants from the Bread Loaf Writing Conference, Virginia Center for the Creative Arts, VCCA France, Ragdale, Atlantic Center for the Arts, and Yaddo, and is an active advocate for those who live with language disorders like aphasia. A STITCH OF TIME is her first book. Lauren Marks was 27, touring a show in Scotland with her friends, when an aneurysm ruptured in her brain and left her fighting for her life. She woke up in a hospital soon after with serious deficiencies to her reading, speaking and writing abilities, and an unfamiliar diagnosis: aphasia. The way she perceived her environment and herself had profoundly changed, her entire identity seemed crafted around a language she could no longer access. She returned to her childhood home to recover, grappling with a muted inner monologue and fractured sense of self. Soon after, Lauren began a journal, to chronicle her year following the rupture. A STITCH OF TIME is the remarkable result.